The religious art form of the mandala (cosmic diagram) originated in India, the first homeland of Buddhism until around 1200. Over the last thousand years, the Tantric Buddhist practice of painting mandalas on cloth or on temple walls became highly developed within the remote monasteries of Tibet. This esoteric tradition gave rise to powerful symbolic images of great complexity and beauty, which in former days would have been seen only by a few initiated monks, as aids to meditation or the visualization of particular deities. This very finely painted Tibetan mandala is dedicated to Guhyasamaja–Manjuvajra, an aspect of Akshobhya (the ‘Imperturbable’) Buddha. He presides at its centre, in close embrace with his prajna (wisdom goddess), representing the ‘Secret Union’ (Guhjyasamaja) of Wisdom and Compassion as the means to Enlightenment. The central couple is surrounded by four more Buddhas, governing the four cardinal points, who are flanked by wisdom goddesses occupying the intermediary directions. Further auspicious goddesses and protective deities are seen beyond this inner circle and in the further regions of the mandala, while eminent lamas and monks of the Sakyapa order preside in a long row above it. 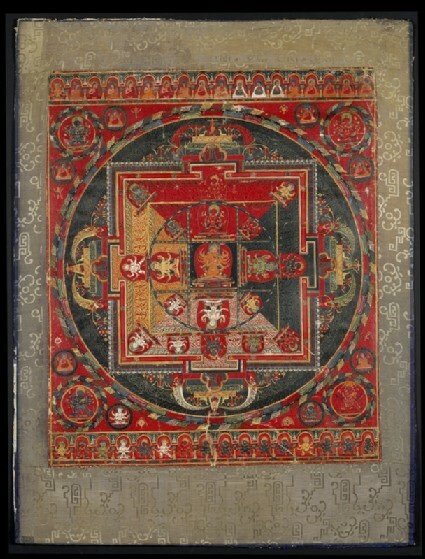 This mandala may have been produced by Newar painters from the Kathmandu valley in Nepal, famous for the delicacy of their art, who are known to have produced related works for the Ngor monastery, south-west of Lhasa. Purchased with the assistance of the Neil Kreitman Foundation, in memory of Hyman and Irene Kreitman, 2007. This mandala is the first in the series called the Vajravali or 'Garland of Vajras'. The Vajravali is a practical guide to all the preliminary rites preceding a monk's initiation into the group of twenty-six main mandalas. This anthology of liturgies depicting deities of the Vajrayana Buddhist pantheon, together with its companion compendium called the Nispannayogavali which gives the details of all the mandalas, form a unit which was composed in India between 1101-08 by Abhayakaragupta, a scholar who served as abbot of the Vikramasila monastery. Following its first translation into Tibetan in 1204, these liturgies and mandalas enjoyed great renown in Tibet . In the fourteenth to fifteenth centuries, several series of the Vajravali mandalas were made both as mural paintings and as thangkas (portable scroll-paintings), both at Sakya and at sub-schools of the Sakya monastic order such as the Ngor monastery. The lineage of lamas and monks in the upper border of this thangka comprises several eminent Sakya pa monks, which indicates that it was commissioned within the context of the Sakya monastic school. This very fine mandala painting is dedicated to Guhyasamaja-Manjuvajra, an esoteric aspect of the Buddha Akshobhya, the 'imperturbable' Buddha, lord of the Eastern direction. The name Manjuvajra literally means the 'Gentle Vajra', while Guhyasamaja means 'Secret Union'. His mandala is called the nine-deity Guhyasamaja-Manjuvajra mandala because there are nine sections to the central circle. Guhyasamaja- Manjuvajra, the central Buddha, constitutes the embodiment of the Secret Union by virtue of the inseparable embrace with his prajna (wisdom goddess), representing the union of wisdom and compassion as the means to enlightenment. The couple is surrounded by four more Buddhas, the five Buddhas together representing the four cardinal points and the centre of the cosmos: Vairocana is white, governing the Eastern quadrant; Amitabha is red, governing the West; Amoghasiddhi is green, governing the North; and Ratnasambhava (here named Ratnesa) is yellow, governing the South. Each of the four surrounding Buddhas is represented with six arms, seated alone on a lotus cushion, and is accompanied by a wisdom goddess, positioned in the intermediary directions and filling the remainder of the nine divisions of the circle: the white Locana is the prajna of Vairocana; the black Mamaki is prajna to Ratnesa; the red Pandara is prajna to Amitabha; and the yellow Tara is prajna to Amoghasiddhi. In addition, there are six Vajra goddesses who accompany the principal Buddha group just outside the main circle. The gates of the four directions are guarded by the black Yamantaka in the east, the white Prajnataka in the south, the red Padmantaka in the west, and the black Vighnantaka in the north . While the composition of the mandala adheres precisely to the requisite indications of the Vajravali, the artist has visibly delighted in its embellishment and ornamentation with highly varied motifs of ornate scrollwork, emphasized by the juxtaposition of contrasting colour fields of primary colours for each section of scrolling. This creates a sense of perspective and volume for the architectural plan of the circular sanctuary. The scrolling is carried to the very edges of the thangka, beyond the borders of the sanctuary, and the painting is framed by a geometric rice-grain motif in deep blue, red and yellow. The overall effect is a kaleidoscope of brilliant colour. Although there are no inscriptions extant on the front of the thangka, the lineage corresponds to the Sakya monks and sages known from other mandala series produced in Tibet for the Ngor monastery between 1429-56. These however are almost twice as large as the present mandala . Another Vajravali series mandala of approximately the same period and size as this painting is similarly characterized by an extreme sense of minute detail and by broad fields of contrasting colours . The great finesse of the Newar painters of the Kathmandu Valley was so renowned that many were invited to Tibet, especially to the Ngor monastery in the early fifteenth century . 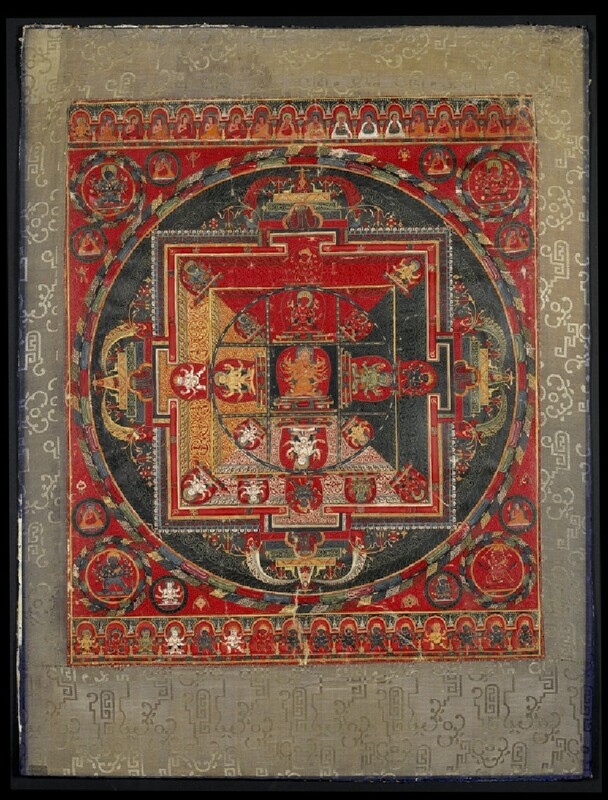 The accentuated scrollwork and minute detailing of this mandala suggest that it was painted either by visiting Nepalese artists or by Tibetan artists closely emulating the Newar style. 1 See Buehnemann, 'Remarks on the author Abhayakaragupta and his works'. 2 Vira and Chandra, Tibetan Mandalas (Vajravali and Tantra-samuccaya), p. 22: Mandala of Guhyasamaja- Manjuvajra. 3 See Kossak and Casey Singer, Sacred Visions, pl. 47: three paintings from the Vajravali series. 4 See Heller, Tibetan Art, no. 87: Hevajra Kapaladhara Mandala, 50 x 45 cm. 5 Heller, op. cit., pp. 146, 177.